The research design is the overall plan of your research study. It defines the type of study you are going to undertake, sub-type, research problem, hypothesis, variables (dependent and independent), experimental design, data collection methods, etc. The design of your research may depend on the type of information the researcher wants to uncover as well. 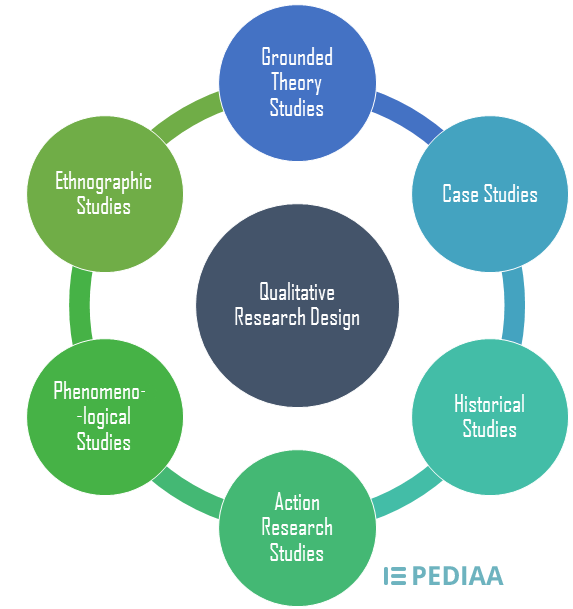 Thus, there is a difference between research designs used in quantitative research and qualitative research. Qualitative research is investigative or exploratory in nature and is used by researchers to observe human habits and behaviour. A qualitative approach is used to analyse a problem in depth and develop theories or hypothesis. It is also used to understand underlying causes, opinions, motivations behind something and to discover trends in opinions and thoughts. This is considered to be a subjective approach since this contains observations and descriptions instead of purely statistical data. Data collection is done by interviews, observation and analysis of documents. Grounded theory approach is a special approach whose main purpose is to develop theories. This type of study doesn’t commence with any pre-existing hypothesis or theories. Instead, the theory is developed after the analysis of the collected data. The researcher involved in this research design will first collect data through interviews, observations, review of records or a combination of these methods. He or she will then analyse the collected data and notice recurring ideas and concepts, which will be tagged with codes. As the data analysis progresses, codes will be grouped into concepts and concepts into categories. Categories will then serve as the basis for the theories. Historical studies examine past events to understand the present and expect potential future effects. The process involves selecting an appropriate topic after reading related literature, developing research questions, finding an inventory of sources such as achieves, papers, private libraries, etc., verifying their validity and reliability, and collecting data. The analysis of data in this approach will involve the synthesis of all information, and reconciliation of conflicting information. A case study is a detailed investigation of the development of a single phenomenon or an individual over a period of time. Case studies are generally used to explore complex issues using both qualitative and quantitative data. They are holistic, systematic, context-sensitive and layered. They start with the identification of the research problem, which is then followed by the selection of the cases and the data collection and analysis method. The next step involves the collection of data in the field and analysis. Since case studies focus on a single phenomenon, it is somewhat difficult to use this data to form generalisations. Action research is a type of a research approach that aims to solve an immediate problem. This design can involve a combination of analytical, investigative and evaluative methods designed to diagnose and solve problems. The researcher, who will also act as a participant, will first identify a research problem, clarify theories regarding it and then identify research questions. Next, he will collect data on the problem, and organize them. Then the data will be analyzed and interpreted, and a plan will be created to address the problem. The last steps of this research design involve the implementation of this plan and evaluation of the results of this plan. Phenomenology is a study that aims to understand the subjective, lived experiences and perspectives of participants. This is based on the main idea that there are multiple interpretations of the same experience and these multiple interpretations or meanings make up of reality. This approach involves long and intensive interview sessions with various participants in order to gather information about unique individual experiences which offer a rich description of human experiences. Ethnography is the systematic study of communities and cultures. Researchers engaged in ethnographic studies participate, either overtly or covertly, in the daily lives of the population that are being studied. They spend an extensive time period among this population, watching what happens, listening to what’s being said and asking questions. Interviews, observations and analysis of records are the main methods of data collection in an ethnographic study. The main aim of an ethnographic research is exploring and studying culture from an insider’s point of view. As explained above, the research design of a qualitative research study will depend on the type of information the researcher wants to uncover. Although this article only discusses six research approaches, a researcher can use more methods or create his or her own design to discover and evaluate information about a research problem.